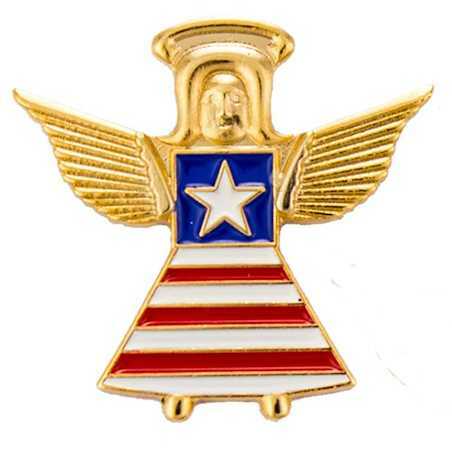 Angel with horizontal flag body lapel pin. Hand enameled with gold finish USA flag patriotic pins. Clutch back America's Army Guardian Angel. Proud to be an American and proud to show it. 3/4 inch tall. Display your national pride wherever you travel. Pins are enamel-baked with bold red, white and blue colors and smooth face. Ideal for everyday wear as well as Memorial Day observance. Pay homage to our US military personnel and veterans by adding these fashion accessories to your favorite hat, necktie, suit lapel or sweater. IDEAL GIFTS for proud military parents, spouses and older children, as well as veterans and all Americans. Let the world know that you support our armed services.